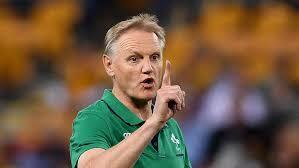 Ireland coach Joe Schmidt sprung a few surprises with his team to face England this weekend. Joe Schmidt has hit back at John Mitchell after England’s Kiwi defence coach claimed Ireland were “boring” ahead of their Six Nations opener in Dublin on Saturday. Former All Blacks coach Mitchell earlier this week admitted Ireland were the world’s best, but said they would try and “bore the s..t’ out of England in a “brutal” encounter at the Aviva Stadium. The All Blacks lost 16-9 to Irish in the same venue last November but Schmidt has dismissed Mitchell’s jibe as “banter” after Ireland’s coach and counterpart Eddie Jones revealed their teams for the first round of this year’s Six Nations. England’s Kiwi defence coach John Mitchell claimed Ireland were boring earlier this week. “I don’t think for a moment that it’s going to be boring. I think it’s going to be exhilarating,” New Zealander Schmidt told media on Thursday. Ireland have surprisingly switched Robbie Henshaw to fullback, while Manu Tuilagi and the Vunipola brothers are back in the England team with Elliot Daly picked ahead of Mike Brown to start against the defending champions. Henshaw was moved from the centres to start for only the second time at fullback, where he made his test debut in 2013. The switch was triggered because Ireland had depth in midfield, and incumbent fullback Rob Kearney was rusty after recovering only recently from thigh trouble. Blockbusting England centre Manu Tuilagi will make his first Six Nations start since 2013 in Dublin. Henshaw was only recently over hamstring problems, and coach Joe Schmidt was worried more about his fitness than his abilities at fullback, where he started out for Connacht. Schmidt added Kearney wasn’t quite ready to play, and Henshaw has been training at fullback with Ireland for more than six months to broaden their options. “The greater risk for Robbie is lack of game time, fullstop,” Schmidt said. Henshaw was moved to keep together the midfield of Garry Ringrose and Bundee Aki, who excelled in November in beating the All Blacks. The only other change to the starting side from the first home win over the All Blacks was the return of star halfback Conor Murray. Flanker Sean O’Brien, who broke his arm against Argentina and missed the All Blacks test, was in the reserves. Josh van der Flier was starting. ​Tuilagi, profiting from an injury to Ben Te’o, will make his first test start for England since June 2014, and first start in the Six Nations in six years. It will be at inside centre, though, where he hasn’t played a lot following knee, chest, and groin injuries. The Vunipolas, prop Mako and No 8 Billy, missed the November series because of injuries, and will appear for the first time since last June on the tour of South Africa. But Daly will start with Jonny May and Jack Nowell on the wings after new sensation Joe Cokanasiga was ruled out injured. Brown didn’t make the matchday 23. Chris Ashton was the backup. Dan Robson was the only uncapped player, the reserve to halfback Ben Youngs, who will partner with captain Owen Farrell. Ireland: Robbie Henshaw, Keith Earls, Garry Ringrose, Bundee Aki, Jacob Stockdale, Jonathan Sexton, Conor Murray; CJ Stander, Josh van der Flier, Peter O’Mahony, James Ryan, Devin Toner, Tadhg Furlong, Rory Best (c), Cian Healy. Reserves: Sean Cronin, David Kilcoyne, Andrew Porter, Quinn Roux, Sean O’Brien, John Cooney, Joey Carbery, Jordan Larmour. England: Elliot Daly, Jonny May, Henry Slade, Manu Tuiagi, Jack Nowell, Owen Farrell (c), Ben Youngs; Billy Vunipola, Tom Curry, Mark Wilson, George Kruis, Maro Itoje, Kyle Sinckler, Jamie George, Mako Vunipola. Reserves: Luke Cowan-Dickie, Ellis Genge, Harry Williams, Courtney Lawes, Nathan Hughes, Dan Robson, George Ford, Chris Ashton.